What are the qualities that Stanford GSB is looking for as they build their class? How do successful applicants stand out from the crowd? At a school as competitive as Stanford, it’s a fact that many smart, accomplished applicants won’t get in—so how can you demonstrate that you have that “it” factor? Let us walk you through Stanford’s evaluation criteria and give you some advice. Of course, Stanford GSB seeks demonstrated leadership potential – don’t all b-schools? And naturally you’ve got leadership, or you wouldn’t be applying to Stanford. But. There are some unique nuances to Stanford’s conception of leadership that are essential to understand in order to portray it effectively in your application. Let’s break the phrase down word by word, starting with the core principle. Even if you are already a leader per the above definition, you’re not satisfied. You know that improving will only enable you to achieve more of what you value – therefore you actively seek to grow as a leader. You are open to critique and feedback, you are resourceful, you are humble, and you are hungry to learn. Concrete evidence that convinces the adcom to conclude that you will grow as a leader and provide leadership in the future. You must demonstrate both leadership and potential to grow as a leader. For the former, provide this evidence by portraying experiences in your application boxes, essays, resume, and (if you provide some inputs for your recommenders) recommendations that reflect your leadership to date. For the latter, in these same application components frankly reflect on where you are in your leadership development – you understand what parts are innate to you, and where you need to improve. So “demonstrated leadership potential” is actually rather complex. Spend some time and effort on a strategy to integrate these points into your entire application. Check out the first post in this series, Understanding Stanford GSB’s Core Value Of Intellectual Vitality. Applying to Stanford? 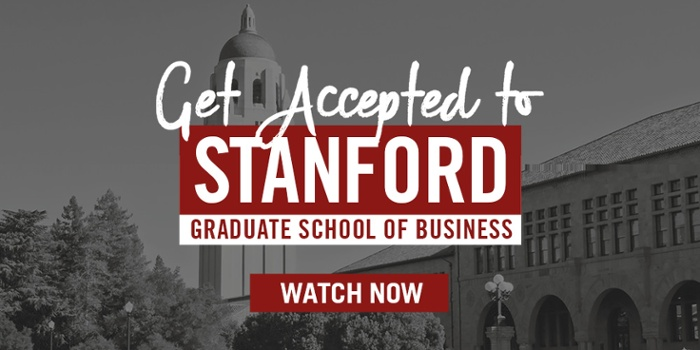 Check out our MBA Admissions Services and work one-on-one with an expert advisor who will help you create a stand-out application for Stanford GSB. Click here to learn more about how we can help you get accepted. Cindy Tokumitsu has advised hundreds of successful Stanford applicants, helping them gain acceptance to Stanford along with other top MBA and EMBA programs in her 15+ years with Accepted. Want Cindy to help you get Accepted? Click here to get in touch! Last updated on July 16, 2018.